As a boy growing up in Australia, Clinton was often left confused and frustrated when working with his horses. That’s why he decided to put together this comprehensive series targeted at first-time horse owners or those just entering the industry. The series covers every topic imaginable, from picking out the right horse to basic groundwork and riding exercises. A master teacher, Clinton breaks horsemanship into the simplest terms and walks the beginner rider step-by-step into the horse world. Throughout the series, Clinton works with a novice rider who is timid around horses and lacks the confidence to be an effective leader. 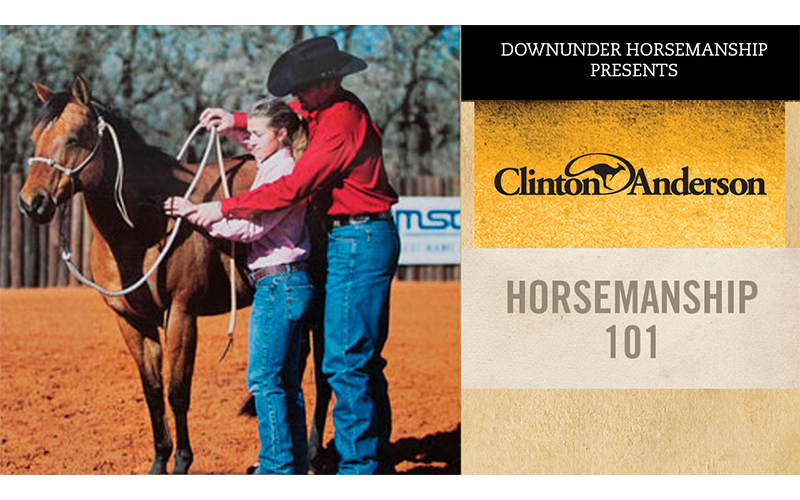 Under Clinton’s guidance through the Downunder Horsemanship Method, she becomes an enthusiastic student confident in her ability to control her horse and advance to the next level. Entirely devoted to the beginner rider, this series tackles the most common and critical questions new riders face in an easy to understand format that will keep you safe and confident throughout your riding career. You’ll learn with a beginner rider just like yourself and watch as she overcomes fears and gains confidence in her ability to be an effective leader for her horse. By the end of the series, you’ll see how the right approach to horsemanship can turn a new rider into a confident and in-control horseman. Whether you’re just entering the horse world or have a craving for more knowledge, this series will put you on the right track!